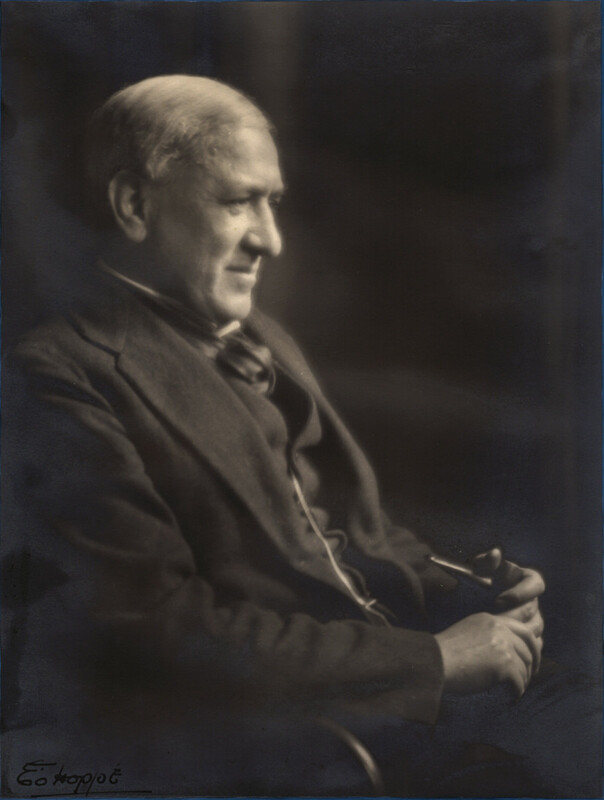 Portrait of Mackintosh as an old man, seated side-on, holding a pipe in his left hand. Emil Otto Hoppé (1878-1972) was one of the most important art and documentary photographers of the modern era whose artistic success rivaled those of his peers, Alfred Stieglitz (1864-1946), Edward Steichen (1879-1973) and Walker Evans (1903-1975). Hoppé was one of the most renowned portrait photographers of his day, as well as a brilliant landscape and travel photographer. His strikingly modernist portraits describe a virtual Who’s Who of important personalities in the arts, literature, and politics in Great Britain and the US between the wars. Among the hundreds of well-known figures he photographed were George Bernard Shaw, H.G. Wells, A.A. Milne, T.S. Eliot, Ezra Pound, G.K. Chesterton, Leon Bakst, Vaslav Nijinsky and the dancers of the Ballets Russes, and Queen Mary, King George, and other members of the Royal Family. Beginning art photography in 1903 Hoppé was admitted as a member of the Royal Photographic Society where, over the next four years, he regularly exhibited his amateur photographic works. In this same year Hoppé was also associated with The Linked Ring Brotherhood and fellow members Alvin Langdon Coburn, Henry Peach Robinson (1830-1901), and George Davidson (1854-1930), who played an important role in international art photography, maintaining close ties with continental and American groups including the Vienna Camera Club and the Photo Secession, New York.